Summer is coming up, and a summer in Pasco County is nothing to scoff at, even when your air conditioner is functioning perfectly. At Benjamin Brothers, we are HVAC experts who have seen it all when it comes to air conditioning repair and overall maintenance. Unfortunately, various air conditioning myths are something that are all too common. In this blog post, we’re here to debunk some of these misconceptions, so you don’t fall into bad habits that will leave your air conditioner in need of repair! Make sure you don’t buy into the following myths! Wrongo! For some reason, a lot of people are under the impression that your air filters seldom need replacing. Once a year? Try once a month! That’s right, changing out your filter should be a monthly task. Did you know that this could ultimately save you money? A fresh filter helps the AC unit to work more efficiently, and also prevents grime buildup that could lead to a broken down system later. This myth is well-intentioned, but wrong nonetheless. By closing the vents to a room, you’re not actually changing your air conditioner’s output, so you’re not lowering the energy or power usage at all. In fact, you might actually be spending more money if you block vents. 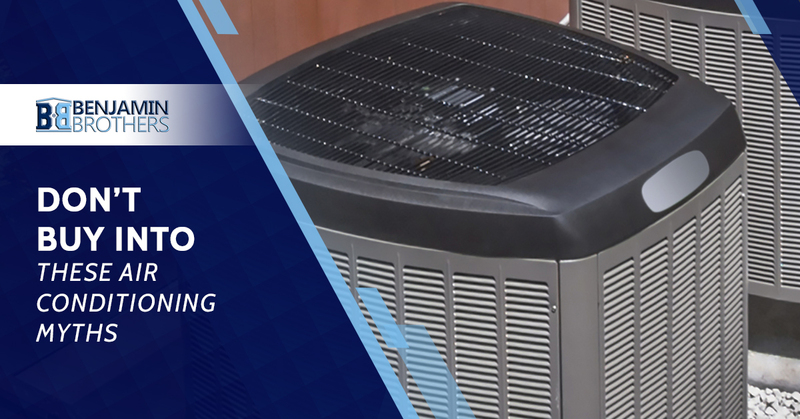 AC systems operate best when the air is evenly distributed throughout the house, so if some rooms are cold while others aren’t, your unit might be working harder than it usually does. This one’s not wrong, but it’s not really right either. It is true that you can save money by not running your air conditioner system, but don’t count on being able to cool your house down. Fans circulate air, and when moving air contacts your skin, it makes for a nice cooling sensation. However, it’s not actually changing the temperature of the air, so the second you turn that fan off, it’s going to be just as hot as it was before. Fans are useful for cooling individual people, while air conditioners are better suited for larger rooms and full buildings. If you want to keep your whole Pasco County home cool this summer, keep your AC running. It’s hard to find a profession or service where people won’t make this argument. People are naturally (and rightly) skeptical of predatory businesses, but that doesn’t mean that everything is a scam. In the case of air conditioners, the need for consistent checkups is absolutely not a lie. We’re not going to sugarcoat it — of course we want your business! Air conditioning repair, maintenance, and installation is our life’s work. But at Benjamin Brothers, we have a commitment to integrity and we would never recommend something to a client unless we fully believed they would be better off for it. Take our word for it — get regular checkups on your HVAC. In the long run, the preventative maintenance will save you a fortune in repair fees. Being in the Pasco County area, we take air conditioning seriously at Benjamin Brothers. We know how brutal a humid Florida summer can be, so we want you to be as informed as you can possibly be when it comes to maintaining your HVAC! While there are many measures you can take at home, there is also the occasional need for a professional touch, and in that capacity, we are happy to serve. If you’re in need of quality HVAC services, contact us today for a free estimate!